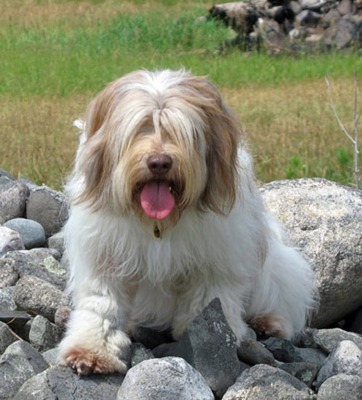 The Polish Lowland Sheepdog is still considered to be a "rare" breed. The National Dog of Poland, its history is rich in drama, including a Polish Princess. There are several books that have been written on this subject that are worthwhile to read. They tell the story of the rise of the breed from near extinction in the early 1950s to present day. You will find some of these listed in our "Resources" section. Introduced into the United States in the late 1980s or early 1990s, the breed is popular with those who are looking for an intelligent, non-shedding, medium-sized dog. There is never a dull moment living with a PON, but if understood, there has never been a better pet in this writer's opinion. Known genetic-linked diseases in Polish Lowland Sheepdog s include hip dysplasia, and rcd4 PRA (progressive retinal atrophy or late-onset blindess). Reputable breeders publish results for these diseases on Orthopedic Foundation for Animals (OFA). 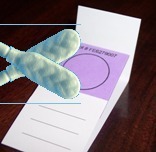 Click the icons below and then "go to link" will open a window listing all PONs who have tests recorded to their registration or a place to order the rcd4 PRA DNA test kit. A physical exam is done by a canine ophthalmologist to determine that the dog's eyes are healthy. This exam is called a CERF, and results are published in the Canine Health Information Center (CHIC) database. A CERF exam is good for 12 months and must be done on all breeding dogs. A genetic tests for rcd4 PRA must be done on both parents of the litter. At least ONE of the parents must be CLEAR to ensure that the offspring will not be AFFECTED by the late-onset blindness associated with this gene. If a dog's rcd4 PRA results do not appear on its CHIC database, you should ask for the documentation before purchasing a puppy from that breeder. Dogs who are carriers and dogs who are affected can be bred to dogs with CLEAR results and the offspring will be clear and carrier. You will need to "X" out of the link at top right to return to the page.